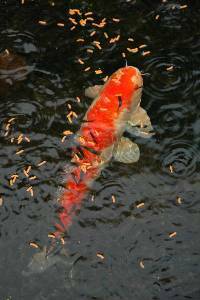 Pondkeepers love assorted varieties of goldfish and koi. Now ponders are discovering that other fascinating fishes thrive in their ponds. Besides the expected cold-water types, tropical and semi-tropical fishes can thrive in temperate climate ponds. All carp, and many other fresh water fishes, belong to the order Cyprinidae. Carp varieties include the well-known koi (Cyprinus carpio) and the goldfish varieties from the common goldfish (Carasius auratus) to all fancy varieties bred from it. These include the shubunkin, pearlscale, oranda, lionhead, black moor, comet, and others. Many of these fish can be kept outdoors in England and other temperate climate areas throughout the winter even when some ice forms on the water. However, the more fancy varieties like pearlscale, oranda, lionhead, and black moor appreciate not being subjected to more than an occasional day of ice coverage. If the pond has a very deep area, so much the better so the fish can descend to the bottom during severe weather. Some koi keepers recommend a pond as deep as six metres (seven feet) to encourage deep body growth. A friend of mine keeps his koi in a pond of 1.3 metres (four feet) plus, a satisfactory depth. Most koi enthusiasts in England never use plants (including waterlilies). They maintain their ponds using powerful pumps to provide a constant exchange of water through vast containers filled with a variety of filtering media. Although I know many of you who keep koi with your lilies, I hear of many instances of the waterlilies being seriously disturbed by the koi rooting the plants out of their pots. Goldfish varieties do not reach the size of koi and, although they enjoy rummaging around plants (and eating them), they are not a threat to established lilies. Koi, remember, can reach almost a metre (three feet) long in some circumstances. The cold-water sturgeon (Acipenser sp.) is becoming popular in English home ponds. The splendid site www.sturgeon-web.co.uk offers all the information you would ever need about these fascinating fish. This supplier and expert of the species is in England, but if you are non-English and wish to acquire sturgeon, I am sure suppliers operate in other countries. Pondkeepers fortunate enough to reside in a more temperate zone (winters without day-long ice coverage) find that they can keep a variety of tropical and semi-tropical fish out of doors throughout the seasons. This happens in the wild, too. Reportedly, non-indigenous fish species have been introduced into Florida lakes and have become a nuisance. The Oscar (Astronotus ocellatus), for example, has become well established and, being an aggressive big fish, seriously threatens some of the species natural to the state. Such a fish, when full grown, may well disturb planted lilies. I keep many of my favourite fish species in a heated greenhouse pond. These include archer fish (Toxotes jaculatrix), uaru cichlid (Uaru amphiacanthoides), silver dollar (Metynnis) which have bred in the pond, zebra (Danio rerio) which breed frequently, lace gouramies (Trichogaster leeri), cardinal tetras (Paracheirodon axelrodii), plecostomus catfish species (Hypostomus plecostomus), and even discus (Symphysodon aequifasciatus). All of these thrive extremely well. However, I emphasize that the pond is kept never knowingly lower than 80F (27C) degrees. It does descend to around 75F (24C) degrees and the stock could stand 70F (21C) degrees, but uaru and especially discus would not enjoy too long as low as that. 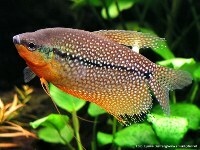 With the exception of lace gouramis and zebras, most of the others require soft acid water (discus and uarus in particular), and for this I use both rainwater and RO (reverse osmosis) water. The archer fish, although a lover of brackish water, tolerates fresh water. It's great fun to see them fire water at flies and other insects, mostly swimming near the surface of the water. They can jump out of the water and end up as dried fish on the ground. Only experienced aquarists should consider keeping discus because their water conditions and other needs must be strictly monitored; and they're quite expensive fish to buy. Image from Bishop Museum.org If I lived in Florida, I would grow tropical fishes outdoors and keep a pond heater set at 75F (24C) degrees in case the air temperature drops too low. The alternative would be to restrict the inhabitants to those who can stand a wider range of temperature. Mosquitofish (Gambusia affinis) are native to the mild winter climate of southeastern portions of the United States. Introduced into California as early as 1922, they are one of the most effective non-insecticidal, non-chemical methods of controlling mosquitoes. Being viviparous, they require no special environment (as most other fish do) for depositing and hatching their eggs. At about six week intervals throughout the summer, they produce 50 to 100 babies per single brood. The young measure approximately a half centimetre (a quarter inch) in length when born and grow to a maximum size of about seven and a half centimeters (three inches). They begin the work of destroying mosquito larvae at once. Mosquitofish can eat mosquito larvae as fast as the larvae hatch from eggs, as many as 100 per day. The early brood born in April and May begin reproducing when six to eight weeks old. Mosquitofish live two to three years and tolerate a wide range of temperatures. 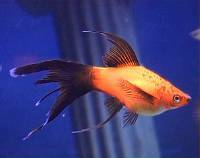 You can keep many aquarium fish varieties in a pond wherever in the world you find a favorable temperature range. Some varieties can live in a wide variety of water temperatures and are quite hardy. The viviparous swordtail (Xiphophorus helleri), both in the well-known red form and colour variations, are very hardy and fast swimming. Paradise fish (Macropodus opercularis) sport a gorgeous mixture of reds, blues, and pale yellow. They withstand a very wide rage of temperature from as low as 50F (10C) degrees up to being comfortable at 90F (32C) degrees, and live for up to eight years. A bubble nest builder like bettas (Betta splendens), also known as Siamese fighting fish, can be aggressive toward smaller fish. Although the males fight within the confines of an aquarium, they seldom fight in a pond offering so much more room and many hiding places. The advantage of these is that you can also keep other plants, such as Cabomba and Ludwigia with them without plants being eaten as in the case with koi and goldfish. At the water surface the plants produce pretty flowers which become an attractive foil for the flowers of our waterlilies. Another excellent and gorgeous range of fishes that may be kept at a wide range of temperatures should be quite well known to many of you. These are the sunfishes Lepomis megalotis and Lepomis gibbosus (pumpkinseed sunfish). The pumpkinseed is regarded as a nuisance and is banned in some places. Both are aggressive fishes and should only be kept with larger species because they grow to 15 to 20 centimeters (6 to 8 inches). Other sunfish are the Enneacanthus species such as gloriosus. Many other sunfish make be good inhabitants for your ponds. In conclusion, I find that many interesting varieties of fishes can be kept in the warmer ponds. If your pond is in a much colder zone, you would be better off keeping the cold water species. Of course, many types of these cold-water fish are extremely common, such as dace, tench, rudd, common and mirror carp, and not particularly colourful.